What Am I Doing? : Intake, Doncaster is full of tramps! Intake, Doncaster is full of tramps! Trampolines, to give them their proper name. Who knew?! I'm currently reading Lynsey Hanley's book 'Estates: An Intimate History', about the development of council housing in Britain and what the social and psychological effects of the architecture have on those living in them. I'm sure that once I've finished the book I'll have something more comprehensive to say, which will probably warrant its own blogpost. In the part I've just read, she mentions the ideal of new postwar council estates as suburban 'Garden Cities' and this got me to thinking quite how much greenery was built into Intake, the estate where I've lived all my life. Quite bizarrely, in Google searching Intake, I stumbled across this piece of research by the National Trust of Australia, which examines the social reality of living in council estates and which used Doncaster as its case study. Yet more amazingly, there is a diagram of Intake in its strange symmetrical glory. I've never seen a map and was quite astounded to see it's shape, and quite how obviously artificial and 'planned' it is, as opposed to neighbourhoods which quite gradually develop over time. Allow this to be a taster of what is to come - I intend to look in more depth at Intake as a Garden City once I've read the books completely. I was speculatively looking on Google Maps at the area and I noticed something far more unexpected. Practically half the houses in Intake have trampolines! 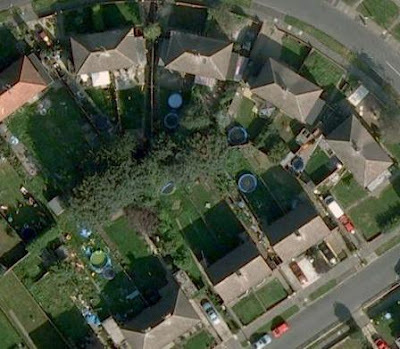 It was quite strange looking at the map as back garden after back garden had a black circle with blue trim. I'm not quite sure why its so strange to me - I could blame 'Keeping up with the Joneses' I suppose. 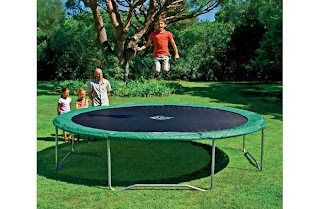 It just doesn't make sense to me - I've never heard any talk of trampolining as a hobby. I appreciate, with blissful retrospect, the joys of jumping (both up and down) but its the sheer number of houses. Knutsford has swimming pools and Intake has trampolines. Amazing. Here are some of the unexpected findings. What can explain this odd phenomenon?! I had a quick peruse of neighbouring and local council areas like Edlington, and didn't find nearly as many. 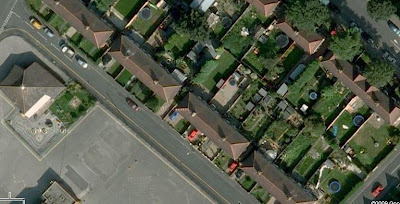 Who'd have thought that Google Earth, which can map the world, would only become interesting to me once I look from above at what is pretty much outside of my window.